According to Australia’s Oral Health Advisory Panel, dental decay is the second most common chronic disease in childhood after the common cold. 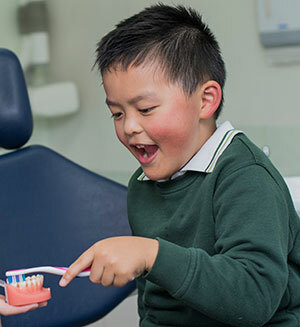 In fact, over half of Australian children aged 5-6 years have a history of tooth decay in their baby teeth and a growing body of research shows that poor oral health at an early age can significantly affect school performance, social skills and self-esteem. However, dental decay is nearly 100% preventable with brushing, flossing, fluoride, and regular dental visits. Dental pain is a distraction for children, decreasing their ability to learn in school and causing their grades to suffer. Children and teenagers with healthy teeth have better attendance, are more attentive in class, and have higher participation rates in school-related activities. As numerous studies across the globe have shown, oral health has a direct correlation to numerous overall health conditions such as obesity, diabetes, and even heart disease. The future of oral health is with our children. So, let’s work together to make children’s dental health a priority at home. Doing so will in turn make a positive impact on the overall health of our children in our local Noble Park community and beyond. We work with parents and children on prevention of dental disease through improved home care and nutritional education, thus keeping them from undergoing difficult procedures. This motivates children to keep their smiles healthy, visit the dentist regularly and want to lead a healthy lifestyle. Dr. Van and his team are committed to making your child’s visit to VN Dental Clinic a pleasant, friendly, and non-threatening experience. Call us on 03 9790 1177 to arrange a time for your child’s dental visit and feel free to ask more questions about CDBS bulk billing while you’re at it.